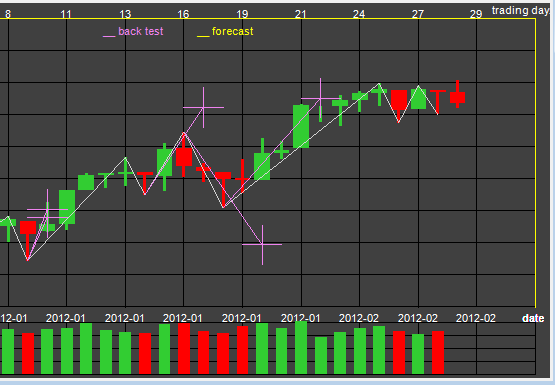 SMFT-2 (Stock Market Forecast Tools) is a new integrated system by Addaptron Software. It is the next generation of the software that intended to replace older SMFT-1 version. As a result of a few recent development projects, the new version is based on new advanced methods, provides more accurate prediction, and is easier to use. TA Predictor - prediction for day or week period based on Technical Analysis, pattern recognition and Neural Networks (generates composite result). Back-analysis models optimization and batch calculation for comparative analysis included. Waves - Elliott Wave model: back-test optimization, up to 10 waves forecast. Cycles - prediction based on cycle analysis. Week day - search for maximum performance using price behavior depending on week day. It allows discovering the best entry/exit days of week; batch calculation included. Month day - search for maximum performance using price behavior depending on month day. It allows discovering the best entry/exit days of month; batch calculation included. 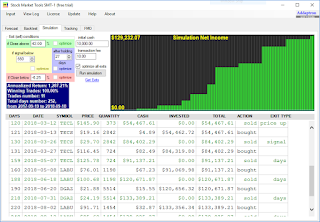 Trading Decision Support System TraDeSS-1 is for institutional traders and investors who deal with ETFs, commodities, and big-volume equities. It is a comprehensive and effective software to help finding the best trading opportunities, maximizing profitability using several predictive models with back-testing features, and optimizing algorithms by running simulations. Since sometimes predictions can fail, to preserve a principal amount in a volatile market, the software enables simulating different risk management approaches. Depending on the character of particular trading assets and the current market conditions some ideas can work better than others. To optimize the strategy in a particular case, the software enables testing different algorithm configurations and finding automatically the best ones. It is especially important for exit points to minimize losses (and ultimately maximize an overall profit). All optimizations can be done automatically by scanning 64 possible logical combinations and adjusting numerical parameters. TraDeSS-1 has also a few independent tools, such as, technical indicators predictor, cycle analysis forecast, Neural Network (NN) forecast, fundamental 3-month rating model for equities, etc. The detailed description is presented in User's Manual (accessible from menu Help after downloading and installing the software). The software is available via the registration (no payment data collected and no obligation to buy). A fully-functional software during initial 30-day period is free. To continue using the software after 30 days, the subscription is required (subscription link is available from the software interface). Technical support and updates are included. Annual lease and perpetual license are available. Paid on-site training (how to use the software) can be provided. There is a simple predictive model that is built on an assumption that the stock market has a semi-cyclical nature. Many technical analysts use cycle analysis in their comprehensive research. The cycles may not be stable all the time but the probability of repeating patterns can be big enough to get a consistent trading profit. Cycle analysis can be made using charts. However, the distinctive cycles in pattern can be masked by more powerful factors (fundamental data, bad/good news, global events, etc.) that over-drive the market time-from-time. Therefore, a special software can be very useful for extracting hidden cycles. 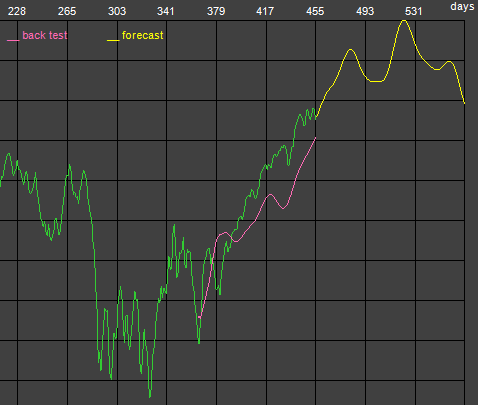 The chart below shows S&P-500 index forecast for April-May and summer months of 2012. The calculation has been performed using Stock Market Predictor SMAP-3. According to this forecast the stock market might continue its uptrend until the end of May, then have some correction in June and top in July. The Elliot Wave model is based on a crowd psychology that changes between optimistic and pessimistic states creating patterns that can be fitted to natural sequences. These days, the Elliott Wave principle can be improved and used in stock market forecast. Combining this method with Neural Network (NN) helps to eliminate the subjectivity in counting waves. Instead of assuming that waves obey only the sequence of Fibonacci, harmonic, or fractal ratios, a more general approach can be used to process all extracted waves. Besides, employing NN enables identifying both the price and date of extremes. Although the Elliott Wave does not generate always accurate and consistent forecasts, its result can be successfully used as an additional input for making a trading or investing decision in modern market conditions. 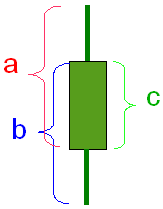 A candlestick is presented using high, low, opening, and closing prices during a certain trading period, for example, trading day. A regular candlestick figure consists of Real Body, Upper Shadow, and Lower Shadow. The Real Body size is proportional to the difference between opening and closing prices. Real Body can be two types - white (green) for uptrend and black (red) for downtrend. Upper Shadow size is proportional to the difference between either high price and closing price in case of uptrend or high price and opening price in case of downtrend. Similarly, Lower Shadow size is proportional to the difference between either low price and opening price in case of uptrend or low price and closing price in case of downtrend. The number of candlesticks that is normally used for predicting can range within 1..12. Evidently, the number of different combinations of several candlesticks in a row can be big. Some believe that there are only 12 major candlestick patterns, others consider this number is 70 or even more. Anyway, in case of chart analysis, it is necessary to remember at least major patterns and process many charts in order to make forecast successful. where RB - Real Body relative size, C - closing price, O - opening price. where US, LS - relative Upper and Lower Shadows correspondingly. US and LS can have values within 0..100%; minimum value equals 0 if Real Body size equals 0, and maximum value equals 100 if Shadow size equals 0. Therefore, we can use these three numbers for formalizing one candlestick. The number of candlesticks that can be used for historical period can be up to 12. So that the number of inputs for NN can be equal 3 * 12 = 36. Two More Inputs for Candlestick Pattern Recognition. As it was discussed above, we can use three major numbers to describe the pattern of one candlestick - relative size of Real Body, relative size of Upper Shadow and Lower Shadow. Also we can use 12 candlesticks with these three parameters for each as inputs. However, it would be insufficient to use only these parameters since each candlestick can have different position and their relative position traditionally is used for the analysis and prediction. where CPi - relative position of i-candlestick; Ci - closing price of i-candlestick; Caver - average of all closing prices (all 12 candlesticks). Except above introduced parameter, it could be reasonable to add one more parameter to distinguish negative and positive candlesticks (black and white) since it makes a significant difference to investors' psychology. So that each black candlestick would have 0 value, white - 1. To summarize, 5 parameters multiplied by 12 (the total number of candlesticks) give 60 inputs. Numerous tests show many possibilities of improving NN candles patterns recognition abilities. For example, output result can be composed from selected optimized calculations based on different historical periods. As well as, there are many other different ways to formalize the shapes and relative positions of candlesticks. Optimal Solution. There is an automated tool FTA-2 (free use of fully-functional version for one month). It has module which enables using Neural Network to recognize typical candles patterns and predict future prices. This module predicts only one next candle but the candles pattern prediction can be successfully used for different widths of candle, i.e., the number of trading days in one candle. The module is enhanced to calculate result that is composed from different historical periods that allows making the forecast more accurate. Also it can perform comparative forecast analysis for many symbols. In general, the stock market demonstrates weakness despite better-than-expected US economic reports and news. The US unemployment rate dropped to 8.6% in November from 9% in October. It is a lowest level in more than 2.5 years, since March 2009. October US retail sales were 7.2% higher than the same month a year ago. Furthermore, the retail sales have been raising for 5 straight months. Improvement in consumer spending was one of the reasons why the economy grew at the best of the year annual rate of 2.5% in the 3rd quarter. US auto sales increased in 14% in November. Also during the 4-day Thanksgiving weekend consumer spending reached a record 16% in total sales from a year ago. Although some of these numbers might be reevaluated and revised in the future, in overall, they indicate improvements. Nothing in this blog should be construed as investment advice in any way. Always do your own research or/and consult a qualified investment advisor. It is wise to analyze data from multiple sources and draw your own conclusions based on the soundest principles. Be aware of the risks involved in stock investments.